Scott just came and quickly, thoroughly and professionally resolved an issue with my drains in my apartment that manifested over the weekend. He fit me in, showed up on time and went right to work trouble shooting the issue. Ended up not needing a more intrusive remedy. In other news, Scott did the septic inspection on my former home and it was his thorough and competent skill set that discovered a second tank in our system that had been overlooked by EVERY OTHER PUMPING CO out there (I used Foothills, Evergreen and Shirley did the closing inspection before we took possesion. )in the 13 years we were in the home and the decades the previous owners had the place. It was a two tank system and only one tank was being pumped. Just imagine the condition of that surprise! There are no competitors if you want your system properly cared for. Thank you Scott Search. We were very happy with Search Septic! 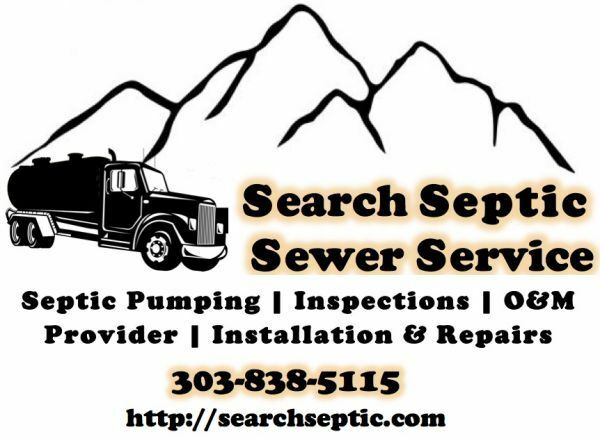 We have lived up here for over 30 years, and grateful to have a reputable, honest, septic company in the area! Thank you Scott for the excellent service. I deeply appreciate it. I have to pump my tank annually (tiny system). I have used every septic company that services the Bailey area. Search Septic is the best. Last bumped by searchseptic on Sep 2, 2018 9:02 pm.